Throughout the ages civilizations hosted and today tourism is opened again to host the ongoing Greek Islands and the oldest ages in science, art, culture, health and education as a center of contemporary history. The name "Dodecanese" "The Twelve Islands", is a island group in the southeastern Aegean Sea, comprising of fifteen major islands. This route is great to see so many different towns, small villages and during the days you will enjoy seeing the different bays away from crowds swim in turquoise sea, or read a great book. Rhodes (Rodos), Simi (Symi), Kilimli (Kalymnos), Kos (Kos), İncirli (Nisyros), İlips the (Lips), the forward (Leros), Patmos (Patmos), Shepherd, Herk A (Halki), the Iliad and the (Tilos ), to İstanbul (Astypalea), Karpathos Karpathos), Kizilhisar (Meis) and is the island of saffron (Safrano). Kalymnos, is a Greek island and municipality in the southeastern Aegean Sea. It belongs to the Dodecanese and is located to the west of the peninsula of Bodrum, between the islands of Kos and Leros. Also known as the island of the Sponge Divers due to its residents’ sponge fishery avocation, sponge fishery has a long tradition on the island. 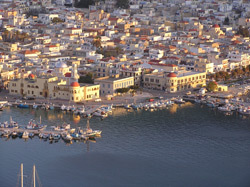 The capital of Kalymnos is Pothia where most of the inhabitants live. Chora is the second largest residential area and the former capital of the island. Kalymnos is a great tourist destination known worldwide for offering plenty of activities such as climbing, scuba diving, and mountains. Starts with Carian settlement on the island and BC 11.y.y, with the invasion of the Greek city-state binding to Dora continued. Kos, one of Greece’s Dodecanese islands, is known for its abundant sandy beaches and it’s also rich with Greek and Roman landmarks, particularly in and around Kos Town. This harbours town is dominated by the 15th-century Neratzia Castle, South of the castle is the Ancient Agora ruins, with a temple, shrine and columns. The 3rd-century Casa Romana villa has lavish mosaics. The oldest on the island date from the day of wine and silk farming brought to light are real. Whether uprising in the island of Rhodes has been an important center for the Greeks . Costa ta democracy BC, began in the year 336 . BC 336 also laid the foundations of today 's Kos, and soon became a protectorate of the Roman Empire and then Byzantium . 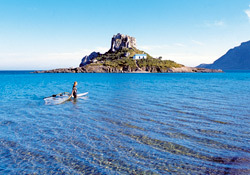 Egyptians have used the island as a center in the Aegean. Today, the island makes a living from tourism economically, with many hotels, restaurants and bars. This small island of the Dodecanese islands located in the north, Patmos in Greece is most famous as the island of Apocalypse. According to tradition, it was in a cave in Patmos island that Saint John the Divine was inspired the Book of Apocalypse. The Holy Monastery of the Apolcalypse, was built as a castle in 1088. This monastery is surrounded by strong walls and looks like a fortress. 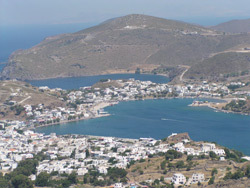 Chora is a great place to walk around the paved paths and enjoy a view to the Aegean Sea. In 2006 the island was declared a World Heritage Site by Unesco. Rhodes, is the largest of Greece’s Dodecanese islands, known for its beach resorts, ancient ruins and remnants of its occupation by the Knights of St. John during the Crusades. The city of Rhodes has an Old Town featuring the medieval Street of the Knights and the castle-like, Palace of the Grand Masters. Captured by the Ottomans and then held by the Italians, this palace is now a history museum. Rhodes, although life based on many years ago after the Roman and Byzantine rule in the rule of the Knights of St Jean in girmiştir.1519 the island in 1920, the Ottomans completed a new head of Italian dominance in Rhodes shows . The Colossus of Rhodes is a statue that was built on the Greek island of Rhodes between 292 and 280 BC. The statue was a depiction of the Greek Titan Helios and was meant to celebrate their victory over the ruler of Cyprus in 305 BC. ... The Rhodians sold the equipment and used the money to build the Colossus of Rhodes. Rhodes, the capital of the Dodecanese, an island which is ideal not only for those who want to relax but also for those looking for an action-packed holiday! With its bright green hills, rich green valleys and uninterrupted line of golden beaches. Rhodes is truly a blessed place, adding its excellent facilities for tourism, the island’s special blend of cosmopolitan, traditional, numerous cultural and archaeological sites making this one of the perfects holiday destinations. Rhodes is a major ferry destination from all the other Dodecanese islands, Crete and several Cyclades, as well as Piraeus. Almost all craft – except cruise ships and catamarans/hydrofoils – dock at remote Akandiá,the easternmost of Rhodes Town’s three ports. 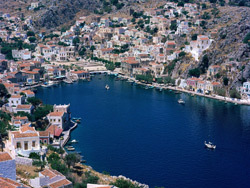 Symi is a Greek island, part of the Dodecanese island group. It’s known for its beaches, an annual music festival and for the harbor at Symi Town, surrounded by colorful neo classical houses. In Greek mythology, King Island's location is referred to as Nireus. Atkeolojik ruins, as well as much of the island's known history dates back has revealed that a settlement. Respectively, on the island Spartans, Athenians, the Roman Empire, the Byzantine Empire and took S.John Knight sovereignty. On the southwest coast, the 18th-century Monastery of Archangel Michael Panormitis is a major Greek Orthodox pilgrimage site with a Byzantine museum. In our recent history of Ottoman rule, of all the Greek islands, such as the Italians dominated by Greece left, especially Europeans nowadays that has become a favorite holiday resort island surviving legacy of the past to future generations intact transfer is one of the rare regions.